The blue floral dress belongs to the beautiful Flo, and the black, red and yellow one was inherited from my maternal great-grandma - a fitting choice for Flo to wear, as she's previously taken photos of me in it. Photos by me - back in May, during a brief burst of summer. We used to bounce on the trampoline. We’d fly up and down, airborne as we sang rhymes and attempted complicated hand-clapping routines mid-jump. I coveted that trampoline, wanting one of my own. Instead, at my house, we dressed up. We wore purple velvet, spangled shawls, old nightdresses, net hats, shiny pink lipstick and shoes three times too big. We performed plays and crafted elaborate stories: pretending to be orphans, hiding in the ‘cave’ under my bed or piling idea upon idea about our future lives. The dramas continued on the day we made a puppet theatre – carving a proscenium arch out of the front of the tall box our fridge-freezer had just arrived in. It was painted in pink and blue, and we squashed inside, peering out into the auditorium of the garden. I have photos of us both brandishing paintbrushes – me with gapped teeth and plaits, she with thick, messy hair and a grin. We’ve had several holidays together on the Welsh coast – back when we were both little. Our two families squashed together around the kitchen table - fighting over the first slice of toast or the last spoonful of pasta sauce. Flo and I (along with various other siblings) plundered the bookshelf for comics, played board games on the faded carpet and let our playmobil toys explore the garden at the back. This garden came to a sharp stop at the bottom, marked with a low, stone wall. Below us there was a path that edged the beach, often frequented by dog walkers. We had a game – ‘accidently’ dropping a playmobil figure over the wall just as someone strolled past. We counted how many would pick it up and return it, and how many strode on. We stopped doing that on the day her princess figure was mauled – left with canine-shaped tooth marks in her dress and hat. There are plenty of other memories I could delve into – unhooking the latch on images of us swimming in the cold, choppy sea or pulling the dustcover from recollections of my jealousy over the two-year age difference between us. But this isn’t a friendship that remains stored somewhere in the past, left behind like many others. No, despite several years of sporadic communication, Flo and I joined forces again when I was thirteen. She took the first set of photos that I ever used on my blog. I wore silver sparkled leggings for one shot, a sixties green mini-dress for another. At that point I saw her as the slightly glamorous ‘older girl’, and was flattered by her renewed interest. But, in recent years, it has evened out into something much more equal – a friendship between two young women who can collaborate on shoots, spend hours lying in fields discussing our lives and toast each other’s birthdays under the stars. Now that she’s moved away, meet-ups are rare. We’re both busy people with plenty to fill our days. But she’s still the one I can confide in when I’m upset; the one willing to cavort through flowers for the sake of a good shot; the one who I can trust to accept me as I am, rather than judging. Plus, we’re both still rather big fans of the dressing up box. Lovely frocks, stunning setting, gorgeous model & great shots...brilliant stuff! The first image is just, superb. This is such a lovely, emotive post, Roz. There is always something special about a friendship triggered from birth or, at least, from a very young age. My own longest-lasting friendship will "be" nine years old later this year, but that pales in comparison to a life-long friendship such as yours and Flo's. Beautiful pictures and love both the dress!! Gorgeous photos, model and background. It certainly sounds like you and Flo have an amazing friendship - one that I can very much relate to. I loved that her mother arrived with a bag of cherries - I now wish there was a scenario in which I could do that. When I saw that second dress instantly the word for it was "glorious." A word that makes certain images come to my mind, such as sunshine and warm mornings outside, but I think now, this dress and these photos will pop up in my mind too. Playmobil! I used to love playing with those. It's great that you've reconnected with Flo. Unfortunately, as I've grown up, I've grown apart from my childhood friends. What an excellent shot with her hair in motion. It's nice to have family friend's and the great bond as the one you have with Flo. I love how you played in the "cold, choppy sea." Your writing is like a favourite old book, you flip the pages and little dust bits fly up and you can see them in the light. I'm so glad the story doesn't fade! 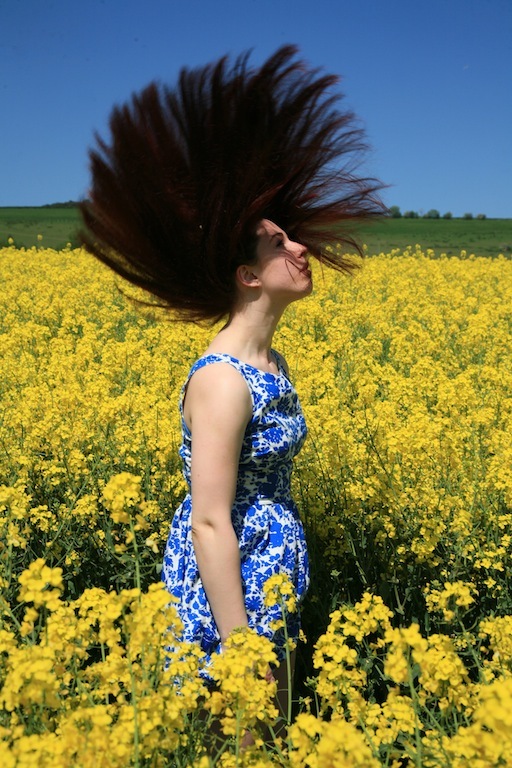 Your friend certainly knows how to toss her hair brilliantly. I wish I could do that. Beautiful woman, beautiful photos. Sorry I have been AWOL. Back now and catching up. There are no words for lifelong friends. I guess there is no need. I have similar friends whom I've known since the day I was born -- in fact, there were tales of "something in the water" in our old childhood neighborhood because all the moms seemed to be pregnant at the same times, guaranteeing playmates for every cohort of kids. Our lives have all meandered from country to country but somehow, we occasionally reconnect in an odd city (sometimes in Asia, or NYC, in the past even in Europe, now occasionally in California)! And thanks to Facebook, we are all still current on each others' lives. AND you're a p'otograp'er?? (Sorry again for t'e enforced (and out of place considering I'm American) cockney accent. Suc' a talented lass! I particularly loved t'e wistfulness captured along w. t'e brig't colors in t'e last s'ot. Okay, can't type more. It's too annoying to try! BTW I'd love your advice (since we bot' love fas'ion and writing.) I'm t'inking of switc'ing from a DELL PC laptop to my first MAC. Can't decide...part of w'y my comp. 's still broken. Would love your t'ougts! What a beautiful picture of true friendship. Your words and photos, as always, just blow my mind. So lovely and meaningful. the photography is awesome! always exciting to see a blog's photos well thought out. i recently attempted a flower/garden photo shoot with my mother. do check it out! You are clever with everything you touches. Wonderful to know that friendship is so highly valued. Much love always, my gorgeous and inspiring friend. Beautiful dresses Flo is wearing. I noticed she is barefoot, which is all the better in that springtime setting. Such friendships are a gift from God. I don't have one from childhood, but I do have one from young adulthood, before children and grandchildren. We met on the train; she lived one stop before me, and we worked side by side in the city. She waitressed in the restaurant and I worked in the boutique next door. That was almost 30 years ago, and she is my "Flo". We've had children, a divorce, and multiple relocations. We still talk about clothes like we did back in the day, and ruminate on religion, relationships, and hair. She has saved my life in so many ways, literally and figuratively. Your gorgeous images of Flo capture a beautiful, vibrant young woman. I am so happy for you both to have such a wonderful friendship!! These photos are gorgeous! And it's always heartwarming to hear people talk about their friendships. It's easy to forget or take for granted the connections we share with best friends, but sometimes they're all that get you through. Cheesy or what? It is very difficult to choose the correct collection. But I like your collection. so beautiful. I like it.